Southwold is a beautiful English town on the East Coast, and although it is most famous for its lighthouse and its pier it is secretly a haven for photographers because of its beaches. Southwold has beautiful sandy beaches dotted with smooth round stones, and most of all each one of its lines of wave-breakers is headed by one of these pillars. On the day that I visited with a friend, the mist had just started to roll in, so the horizon was barly visible and the sun was completely gone. This already beautiful scenery transformed in the camera when I ran a 30-sec exposure, making the stormy sea into a white mist out of which this ethereal, hard shape rose. 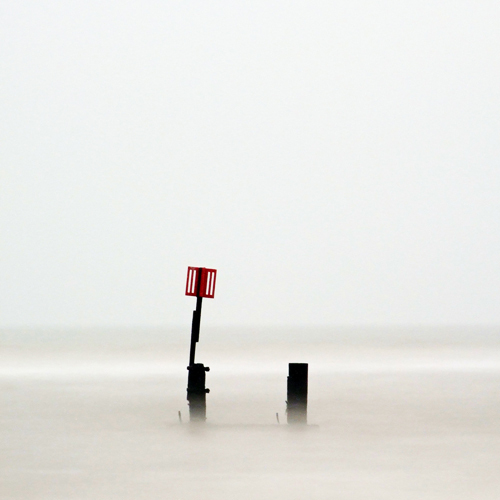 This is one of my best waterscape photographs, and is certainly the most minimal.